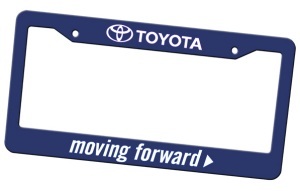 Two styles of car license frames available. Imprint area on top and bottom is 11″ wide x 3/8″ high. Has four holes. Available in white or black. Made in USA. Imprint area on top is 6″ wide x 7/8″ high. Bottom imprint area is 10-1/2″ wide x 7/8″ high. Two holes on top. Additional holes can be drilled for additional charge. Available in white, black or royal blue. Made in USA. Canadian orders please contact us for pricing. Fits most States’ plate and sticker requirements. Please check with your State laws to determine the legality of the frame. 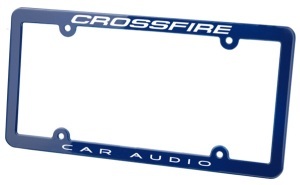 We will not be responsible for frames deemed illegal.